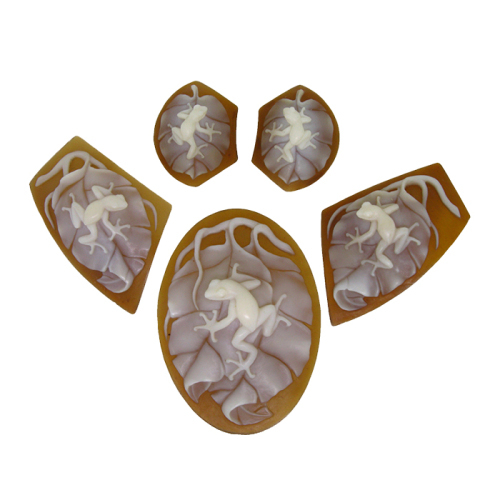 Wonderful 5 pieces Cameo Suite has managed to capture the spirit and movement of the tiny tree frog. Frogs abound in the tropical rainforest, but many species are nearing extinction for a variety of reasons. This wonderful 5 pieces Cameo Suite has managed to capture the spirit and movement of the tiny tree frog, and now only awaits design of the perfect setting to show it off properly. It should be noted that to get a matching 5 pieces cameo suite, even from the same shell, is a rare event because of the natural variations in the material occurring as the mollusk grows and moves in the ocean environment. Each cameo is a signed original, and has been given Registry numbers #2327 (48 mm oval), #2328 (22 mm trapezoid),#2329 (22 mm trapezoid), #2330 (40 mm trapezoid), & # 2331 (41 mm trapezoid). Eco-Friendly, Fair Trade. This suite is sold with a Certificate of Authenticity.